A memory of the Summer that has never been… Very easy to do, bold flavours and can be prepared in advance. What’s not to like..? 1 Have ready a bowl of water with 1 tbsp of lemon juice in it. Finely slice the fennel using a mandoline and place in the acidulated water until just ready to serve, to prevent it discolouring. 2 Finely slice the radishes and place in a bowl. Whisk the oil and remaining lemon juice together. 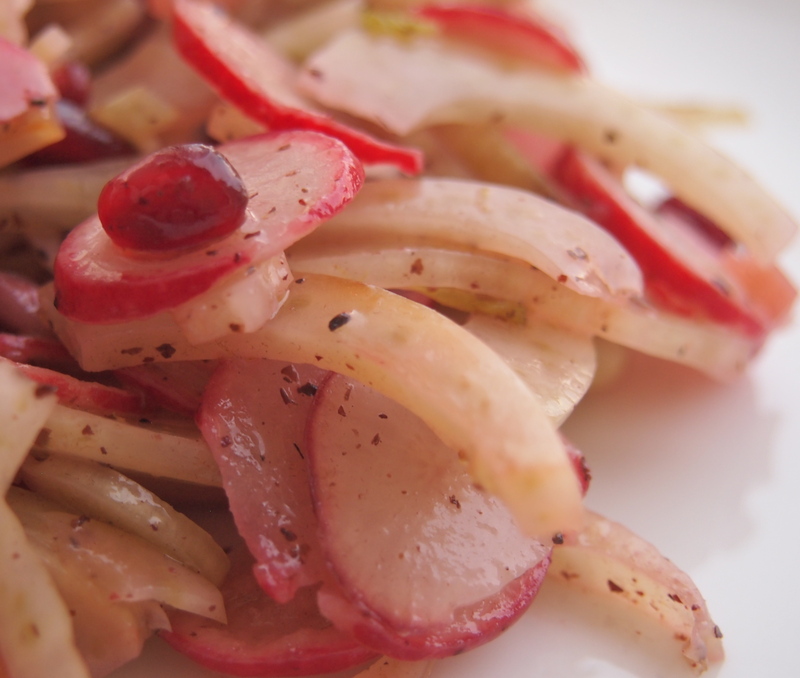 Drain the fennel and mix with the radishes. Drizzle over the dressing and toss gently. Strew the salad over a large serving platter and scatter with the pomegranate seeds, if using. Finish with a dusting of sumac and a little salt then serve straight away.